DC is continuing to fire on all cylinders when it comes to their TV shows. Flash is doing a pretty amazing job of introducing super powered beings on a television budget, and building a giant world. Meanwhile, Arrow is a bit smaller, but in its third season it continues to push into new corners of the DC Universe, and lets its characters change and grow. Neither show is afraid to play with our expectations, though. We comicbook nerds have a good idea of who all the characters are going to be and what their story beats are, so if the shows just repeat them verbatim, where's the fun in that? So while Arrow has a Dinah Laurel Lance, and it has a Black Canary, there's nothing saying they have to be the same person. Actually, if you want to be technical, the character isn't Black Canary - she's just "the Canary," in much the same way that Green Arrow is just "the Arrow." Nobody in this show has any colors! [China White and Bronze Tiger would respectfully disagree --ed.] The Canary is Sara Lance, Laurel's younger sister who was presumed dead in the same boaking accident that stranded Ollie on his island. She was rescued by the League of Assassins, and took the name الطائر الأصفر (Ta-er al-Sahfer - "Yellow Bird"). Sara was played by Jacqueline MacInnes Wood - but that was only in the pilot, and by the time Sara became a recurring character, she was played by Caity Lotz. This is a Gentle Giant sculpt, so the likeness is good, even behind her identity-obscuring domino mask. Yes, proving that she's the smart one in their relationship, Canary was wearing a mask when Ollie was still just wiping paint on his eyes. The costume is strongly influenced by the comics' Black Canary, just... more practical. For instance, she still wears boots, but they're the type of thing you'd see on a biker, not high heels. She's got her bolero jacket and bustier, but in lieu of fishnets, she just has lacing on her thighs to... tighten her pants? I don't know. It keeps the "criss-cross" patten on the legs, without sacrificing the protection offered by not exposing everything below her hips. She also wears gloves, because no self-respecting vigilante wants to leave fingerprints all over the place. Maya Mani is the costume designer, and she did a very nice job adapting Canary for the real world. Canary comes with two accessories: her bo staff, and her Canary Cry. In the show, the staff breaks down into two telescoping batons, but the toy doesn't. Doesn't do either half of it, in fact - doesn't split in two, doesn't telescope. It's just a fancy silver stick, though the sculpt of it definitely makes it look like it would collapse down for easy concealment. Since she doesn't have actual super powers, her Canary Cry is a device she carries around. Her left hand is tight enough to hold the staff, while her right is open wide enough to grip the handheld sonic device. But it's a round little bean of a thing, and can still pop out of her hand easily, so be careful with it - you don't want to lose this under your furniture. The articulation is mostly good, but could be better. She has swivel/hinge ankles, double-hinged knees, balljointed hips, swivel/hinge wrists, elbows and shoulders, a swivel torso, and a balljointed head. Her hair is soft PVC, so it flexes out of the way rather than blocking the head at all. The torso may also have a hinge to go along with its swivel, but if so, mine refuses to move that way at all. And sadly, the elbows don't bend upward very far - only about 45°. Arms are like legs: so far, there's no better choice than double-hinges. It's frankly amazing how good DC is doing with their TV shows. Arrow turned out much better than anyone expected, and despite starring Barry Allen, Flash is actually interesting (meaning it's accomplished something that the comics haven't been able to in 60 years). 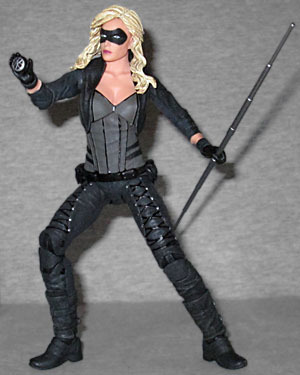 Black Canary has been translated to live-action very well, and this toy does a nice job of capturing that.